Somebody was going to have to pay for the horrible start from the Red Sox starters. And that person is pitching coach Juan Nieves, who was released by the team today. “Given the performance we’ve had to date, while we’re confident we have pieces in place to improve, we felt in order to continue to push forward and make improvement, we needed to have a different voice in that position,” Red Sox GM Ben Cherington said in a conference call on Thursday. Cherington said he “wants to find the right guy” to replace Nieves, and that the replacement might not be in place before Friday’s night’s game in Toronto. Cherington said the rest of the staff would manage the pitching coach duties in the interim. “No, I wasn’t surprised. They know me,” Nieves told WEEI.com’s Rob Bradford Thursday. “We were not pitching well and had a below-average month. I understand the decision that was made. I’m accountable for them. Cherington said he’s looking at a small group of potential replacements. That group includes at least one internal and one external candidate. Despite the success Nieves has had in the past, Red Sox manager John Farrell said he did not believe Nieves made a “connection” with the current group of starters. 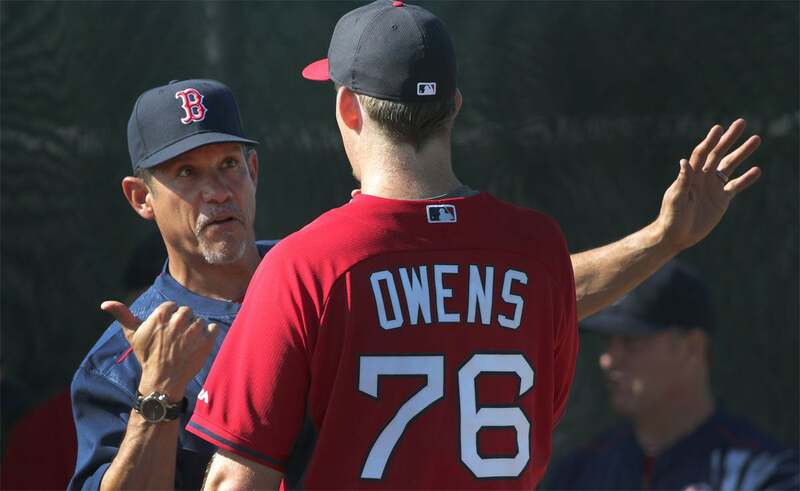 The 50-year-old Nieves joined the Red Sox organization as major league pitching coach on November 7, 2012. In 2013, his first year as a major league pitching coach, the Red Sox staff posted a 3.79 ERA and also set a single-season franchise record with 1,294 strikeouts. This season, the Sox pitching staff is sporting a 4.86 ERA, with starters checking in with a 5.54 ERA, only besting the Colorado Rockies in all of MLB. Prior to joining the Red Sox, Nieves spent 14 years coaching in the Chicago White Sox organization (1999-2012), including the final five years as bullpen coach (2008-12) for the big league club. His coaching career began with a five-year stint in the New York Yankees organization from 1992-96. The Red Sox have also designated reliever Edward Mujica for assignment, according to a report in The Boston Globe. The 31-year-old reliever is 1-1 with a 4.61 ERA in 11 games and 13.2 innings this season with eight strikeouts and three walks.